Our inverter technology communicates with the most commonly used conventional fieldbuses: By opting for us as a manufacturer of drive technology, you are also laying the foundations for trouble-free machine and systems communication. 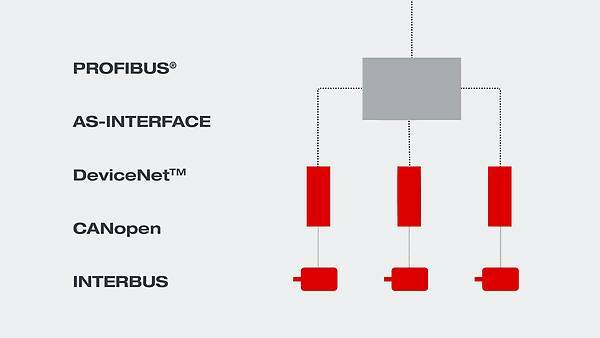 Fieldbuses are an important basis for efficient and flexible automation concepts. All integrated drive components must react quickly, receive commands, process and transmit. Also and particularly with the higher-level controller, as well as with the control level. It is only in this way that you can ensure efficient startups and smooth production processes in your machines and systems. Besides the conventional fieldbuses, our drive technology and drive electronics also, of course, support Industrial ETHERNET technologies. Therefore, place your trust in the technology of one of the world’s leading manufacturers of drive technology and make use of the communication capabilities of our components. This applies regardless of whether your machine or system is installed centrally or is decentralized. And of course also worldwide. on all levels in your system structure. as the conventional fieldbuses are used internationally. is still commonly used in the manufacturing industry but is being gradually replaced by Ethernet-based fieldbuses. is also extensively used and offers lean communication for basic requirements. Significantly more efficient than parallel cabling, which was previously often practiced. Further information is available from AS-INTERNATIONAL ASSOCIATION e.V. is still extensively used in the USA and Asia and is mostly to be found in existing systems. In the meantime, customers are increasingly benefiting from the advantages of Ethernet-based fieldbus systems. CAN technology, which was developed for communication in mobile applications is also used in automation. The CANopen communication protocol was developed and standardized for this. Further information is available from CiA. used to be widespread in the automotive industry but has been replaced by other technologies in the meantime. Depending on the application, data was not only transmitted on the communication medium of copper but also via fiber optic cable. This technology is sometimes still used in existing system components. INTERBUS-Club e.V. has been disbanded.